The severe style, or Early Classical style, was the dominant idiom of Greek sculpture in the period ca. 490 to 450 BCE. It marks the breakdown of the canonical forms of archaic art and the transition to the greatly expanded vocabulary and expression of the classical moment of the late 5th century. It was an international style found at many cities in the Hellenic world and in a variety of media including: bronze sculpture in the round, stelae, and architectural relief. The style perhaps realized its greatest fulfillment in the metopes of the Temple of Zeus, Olympia. The term "severe style" was first coined by Gustav Kramer in his Über den styl und die Herkunft der bemahlten griechischen Thongefäße ("On the style and the origins of painted Greek pottery", 1837, Berlin) in reference to the first generation of red figure vase painters; the name has since Vagn Poulsen’s 1937 study Der strenge stil ("The Severe Style") become exclusively associated with sculpture. There is no firm chronology for the Severe style, the dating of early 5th century BCE sculpture is approximate and consequently its first appearance has been conjectured to be at some point between 525 and 480 BCE. The one exception to this general rule of uncertainty is the Tyrannicide group; a replacement for the bronze created by Antenor in 514 to commemorate the assassins of the tyrant Hipparchus was sculpted by Kritios and Nesiotes and dated in an inscription of 477/6 BCE. This piece, now known only from Roman copies preserves the poses and facial features familiar from archaic art and combines it with a novel treatment of multiple viewpoints, feeling for mass, and anatomical observation that distinguishes it as one of several Athenian transitional works. Another is the Kritian boy, c. 480 BCE whose distribution of weight onto one leg, lowered right hip, and inclination of head and shoulders exceeds the formulas of the late Archaic kouroi marks a step toward the greater naturalism and individualization of the Classical – as B. S. Ridgway puts it: no longer a type but a subject. The depredations of war and the sumptuary laws of Solon ensured that very little sculpture was practiced at Athens in the first half of the 5th century, instead we have to look to others cities to trace the development of the Severe style. We can observe the general characteristics of the period on its greatest masterpiece the Temple of Zeus, Olympia, attributed to the Olympia Master. Here we find a simplicity of forms, especially in dress and the absence of decoration, a feeling of heaviness both in the gravity of the body and the “doughy” cloth of the peplos. Indeed, this era sees a shift from the use of the Doric chiton to the Ionic peplos whose irregular groupings and folds better express the contours of the underlying body. We can also witness on the pediments of the temple the slight pout typical of this time where the upper lip projects a little over the lower and a volume to the eyelids, a striking departure from the fixed Archaic smile of the 6th century and suggestive perhaps of the brooding pathos also typical of the idiom. There is further experimentation with the expression of emotion on the metopes of the temple depicting the labors of Herakles, an experiment not pursued by later Classical art. A certain simplicity or severity of forms, visible in both facial features and the treatment of drapery; a heaviness of traits in open contrast to the lighter features of archaic sculpture; a feeling for the tectonics of the human body which conceives of each figure as composed of certain basic structural sections, as contrasted with the lack of articulation and the emphasis on outlines in archaic statuary. More especially, in the human face the eyelids acquire volume, often appearing as thick rims around the eyes, and chins become particularly heavy; cloth also is made to look heavier and "doughy." The Severe period owes its name to this most evident of all its traits. Contrary to the decorative approach of archaic sculptors, who multiplied details and fractioned into a variety of patterns the basic unity of single garments, Severe artists proceeded as if by a process of elimination, thereby focusing emphasis on the few elements retained. From this point of view the term Severe describes the style more accurately than the terms transitional or early classical, which stress continuity rather than difference. A change in drapery, readily apparent in two forms: (a) a shift from Doric to Ionic fashions; (b) a change in the treatment of the folds ... so that the final effect resembles corrugated iron. The predominant use of bronze. Of the Severe artists whose names have come down to us there are in addition to Kritios and Nesiotes already mentioned also Pythagoras, Calamis and most notably Myron. The latter, a native of Eleutherai, was a late practitioner of the style active in the 450s and 440s and the author of two identifiable sculptures that have survived in copies: his Discobolus and the Athena Marsyas group. Both seemingly original in composition, these works capture several of the chief characteristics of the style in its feeling for the dramatic moment, its rhythm and balance of masses, and the embodiment of feeling through the pregnant gesture. Why this naturalizing trend should emerge in early 5th Century Greek art has been a matter of much scholarly speculation. Renate Thomas summarizes the contending views thus: The significance of the Late Archaic period remains unclear. Is it already a response to the awakening sense of personal value, which will then be held back during the Severe Style through a self-imposed discipline (Schefold), or has there developed, since the Late Archaic period, a new and freer spirit, which, however, becomes clearly visible only in the Severe or even in the Classical style (G. v. Lucken, E. Langlotz, B. Schweitzer)? Did the “Discovery of the Mind” in the sixth century produce two different effect (Schachermeyr), one of which produces new sets of laws through reflection upon traditional norms? Or does only the strong freedom of movement in the figurative art of the Late Archaic period, the self-confident recognition of personal individuality, go back to a change in the sixth century, while the causes of the “purified world of forms” of the Severe Style are others? ^ Arguably High rather than Early Classical depending on date. If following R. Carpenter The Architects of the Parthenon, p.55 we accept the south metopes 13-20 are remnants of the Kimonian Parthenon (Dörpfeld's Parthenon II) then they belong to the end of the Severe period. 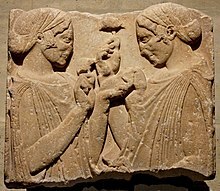 Wikimedia Commons has media related to Severe style Greek sculptures.